There are already more connected devices on earth than there are humans. The number of network-connected and intercommunicating devices is expected to climb well into the tens of billions within a few years. As the world grows ever more connected, how can we trust these devices? Such a network of intercommunicating objects requires a secure and efficient way to track all interactions, transactions and activities of every “thing” in the network. Interoperability, security, compliance, privacy and reliability are all barriers to IoT growth, but the paramount challenge for ubiquitous connectivity, never mind device autonomy, is a lack of trust. Meanwhile, an emerging database technology known as blockchain is demonstrating capabilities previously absent from IoT’s development — many of which foster trust. In the simplest of terms, blockchain is an advancement in record-keeping systems. A blockchain is a construct which supports distributed and immutable record-keeping, verification and authority across all participants, rather than relying on a single point of authority to verify a transaction. Blockchain’s role as an enabler of IoT lies in its ability to securely facilitate interactions and transactions between devices, and to use technology to eliminate corruption through immutable records. Kaleido Insights’ analysis of the intersections between IoT and blockchain surface a wide range of use cases and industry applications. What follows are three scenarios in which decentralized record-keeping offers an architectural advancement to foster trusted machine interactions. Trusted product identities: Blockchain can provide a “single truth” infrastructure for tracking a product’s lifecycle. Just about every product undergoes a series of phases in its existence: growth, design, sourcing of components, manufacture, distribution, retail, service and repair, ownership transfer and so on. By adding sensors and network connectivity to products, we gain visibility into interactions, but to date, visibility remains highly siloed and opaque across parties. For instance, most vehicles on the road today have numerous data streams (including sensors) tracking everything from speed to engine vibration, yet visibility into these analytics is fragmented to the manufacturer in one case, a mechanic in another, an insurance company in another. Even if there are data streams flowing from physical products, visibility into the life of that object — a car in this case — remains fragmented to any single entity. In an effort to centralize all information about a car to a shared and immutable database, immune to fraud or tampering, a company called BigChainDB is developing CarPass alongside energy company Innogy and Volkswagen Financial Services. The first phase of this “machine identity” initiative registers a car’s title, prior damage, service providers, maintenance history and inspection history to a ledger. Introducing telemetry and telematics data, sensor data, financial services data and other third-party data streams introduce all manner of possibility in the shared visibility enabled by blockchain. Trusted device-to-device transactions: Blockchain can provide a “single truth” for device transactions and microtransactions. Most people don’t associate devices or machines with the ability to make transactions on their own, never mind negotiate or accumulate any kind of revenue. Yet, new revenue opportunities unlocked through machine interactions and the ability to automate these interactions are two principal value propositions of IoT. Yet, the current IoT space lacks a transaction structure for network of distributed machines. Blockchain offers an architecture which could enable devices or machines themselves to conduct transactions on behalf of their owners or users, or potentially autonomously on behalf of themselves. Blockchain-based configurations can vary widely and such transactions could leverage digital currencies like Bitcoin or Ether or built-in assets like tokens or credits. As such, this can include “microtransactions” such as digital advertising, gaming, online storage, rights, energy and far beyond. Oaken Innovation recently demonstrated the idea of a blockchain-enabled tollbooth in which both car and tollbooth have Ethereum nodes which use smart contracts to trigger a machine-to-machine (M2M) transaction. Piloting the concept using a Tesla, the car automatically pays as it passes through the toll booth. Sounds simple enough, but here a blockchain configuration presents significant potential cost savings compared to current server and payment infrastructure, fees and time required for traditional tollbooth transactions. Oaken submitted the pilot to UAE’s GovHack for smart city innovations, with similar technology supporting autonomous parking, short-term vehicle leasing and other services which require trusted M2M transactions. Trusted product services: Blockchain can provide a “single truth” for ecosystem-based business models. The advent of IoT has imposed a painful new reality on product companies: To deliver the value of connected products, traditional product-based business models must transform to data-driven service-based business models. More often than not, these models require diverse partnerships or marketplaces of multiple service providers — an ecosystem-based business model. IT and OT integration may be IoT’s sweet spot, but when it comes to exchanging or generating new value across an ecosystem of service providers, transaction processes still require swaths of middlemen and complicated legal structures. Furthermore, diversity of ownership (i.e., of those controlling devices and cloud infrastructure) limits sharing and interoperability. It is in this construct that blockchain offers the potential for ecosystems to generate and move value with vastly greater efficiency and security. One of the earliest blockchain projects called ADEPT (Autonomous Decentralized Peer-to-Peer Telemetry), brought to life a distributed ledger facilitating various types of IoT transactions between devices. 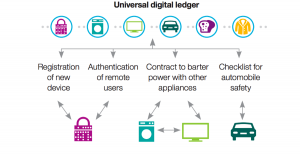 In it, IBM and Samsung partnered to prototype a secure and low-cost universal digital ledger to manage roles, permissions, behaviors, transactions and events — interconnecting disparate connected devices. Consider the opportunities for these disparate manufacturers, brands, service providers, advertisers, insurance companies, energy providers and so forth to use each other’s platforms to extend and improve their services. Smart contracts embedded in the code could trigger, for instance, a TV to request its repair, a dishwasher to order detergent from the supplier, a car to run updated safety checklists — all with the ability to permission and authenticate secure interactions, to verify orders, payments and shipments. This broad shift from centralized networks — operational, technical and financial — to the edge marks a profound change in how economic structures work and demands new mechanisms for trust. Questions, comments, feedback on the opportunities, challenges and use cases for IoT and blockchain intersections? Feel free to reach out! This area marks an ongoing research stream for Kaleido Insights and we welcome inputs regardless of where you sit in the ecosystem.